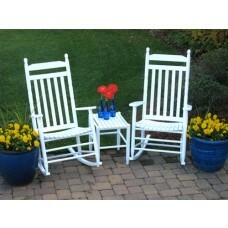 Rocking chair sets help you create an outdoor room or instant indoor relaxation station. 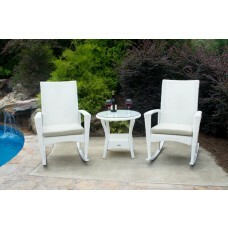 Each set includes two matching rocking chairs and a side table which helps you complete the space. We've got a variety of rocking chair colors, styles, and materials to choose from so that it's easy to find the set which best suits your unique tastes and needs. Shop our full selection now and bring the rocking chair tradition home to your backyard. 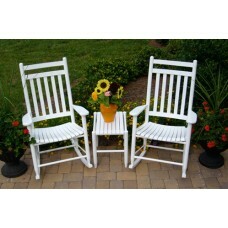 3-Piece POLYWOOD Jefferson outdoor rocking chair set. 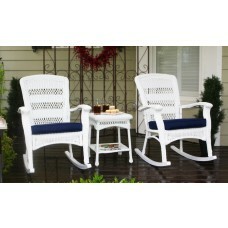 3-Piece POLYWOOD Presidential outdoor rocking chair set. 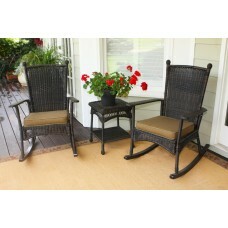 All-weather patio set containing 2 rocking chairs and a table. 2 gorgeous Plantation rockers and side table. 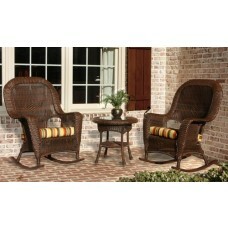 2 wicker rockers and one side table included. 2 classic Lexington Rockers and side table. 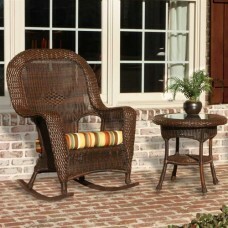 Combo of the classic Lexington Rocker and side table. 3 piece Polywood Presidential rocking chair set. Enjoy classic rocking chair styles, from Bayviews to Spindlebacks. Enjoy synthetic resin wicker which withstands the elements better than real wicker, POLYWOOD which never fades or warps, or the natural beauty and resiliency of hardwoods like cedar. The side tables help to complete the set by drawing it all together and by giving you a place for a centerpiece, or to rest your book or drink during a long summer day. Why buy the pieces separate when you can outfit your outdoor room with one, simple order? That's the beauty of working with each of these rocking chair sets. Shipping is free, and assembly is generally a snap, since we include everything you need to put your set together right in the box. 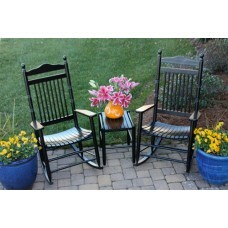 Scroll up to shop our full selection of fine outdoor rocking chair sets today.